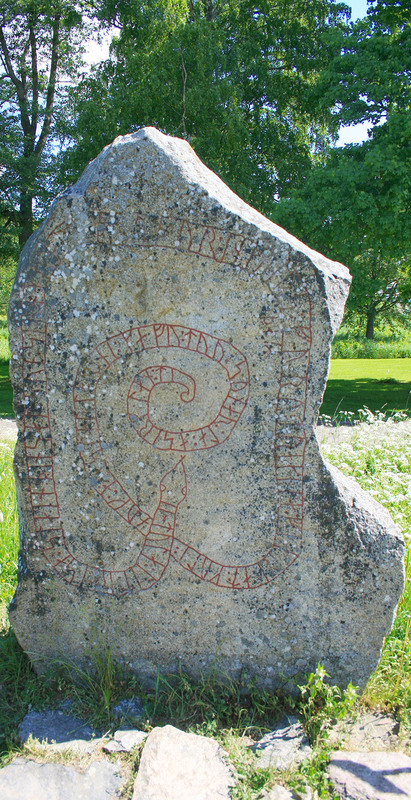 Rune Translation – “Tola had raised this stone in memory of her son, Harald. He was Ingvar the Far-Traveled’s brother. Additional Info – This stone’s words intrigued me as they’re quite different from most I’ve found. ‘gave the eagle food’ means to kill enemies, leaving bodies behind for eagles to feast on. Serkland was the Old Norse name of the Abbasid Caliphate and probably neighboring Muslim regions. This stone was apparently found in the floor of the theater tower in Gripsholm Castle. It stands 2 meters tall and at the widest point is 1.05 meter.